Necessities and Frills for the Whole Family! One of the many things that make travelling so thrilling is all of the unforeseen adventures that life inevitably throws your way. In unfamiliar settings you are forced to navigate your way through an excess of unexpected happenings…a forgotten swimsuit, a misplaced sunhat, a lost shoe. The good news is that we at Hatteras Landing have curated a shopping experience that provides both the necessities and the frills, because when you’re visiting Hatteras Island we want you to feel both the comfort of home and the excitement of vacation. 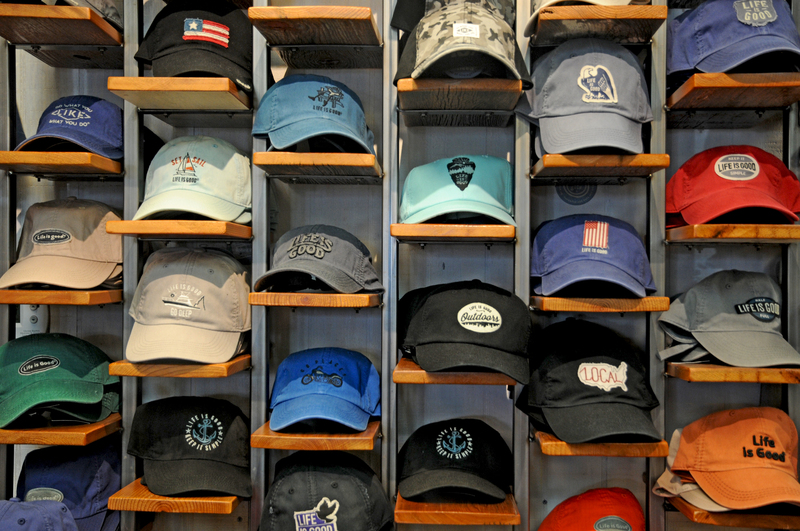 You’ll find a fresh collection of the hottest brand names and styles for the whole family, so be sure to stop by Hatteras Landing today for the perfect shopping experience for life’s unpredictable moments. Whether you are in the school drop-off line, running errands, gardening, exercising, lounging or having a casual day with friends and family, a t-shirt is a common staple piece for every wardrobe. Both comfortable and versatile, a t-shirt has the power to tell a story: where you've been, what you're interests are and so on. Tell your story with one of the many t-shirts that you'll find at Hatteras Landing. Whether you love Hatteras Island, fishing, southern charm or all three, you're sure to find a t-shirt that will tell the tale of your fun-filled trip to Hatteras Island!